I got home tonight and there was a package in the mail from Becky waiting for me! She sent me an adorable pinkeep. It's Shepherd's Bush's "January." I just love it! It's still hard for me to believe that people think of me that much! Words can't express my appreciation. Not just for the gifts, but mainly for the friendship! I feel so blessed in so many ways! Thank you all! 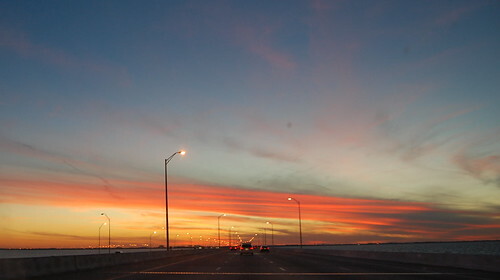 I have to share a picture of the sunset over Tampa Bay as I was driving home. It was spectacular. The picture doesn't do it justice, but you get the idea. Sorry for all the spots, my windshield was just a tad dirty! :) I'm so tired from driving, but I'm going to try to stitch a little anyway! :) Write later! 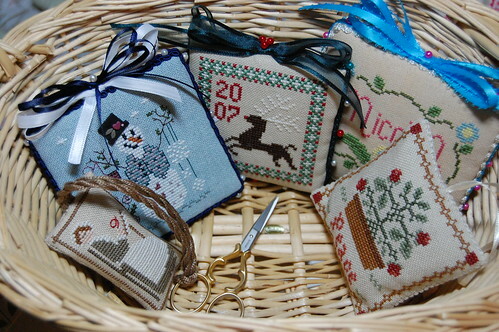 Take care and enjoy your stitching time. Wow Nicole...if that pic doesn't do the scene justice, it must've been amazing in real life! 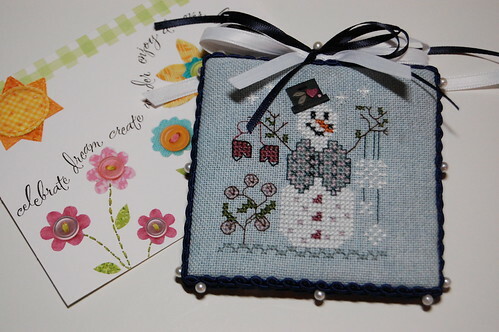 That's an adorable snowman from Becky!! I didn't realize that you live near Tampa...I've been there 4 times in the past 15 years or so for work...SoftLab, Inc. is a software company and I've been there for updates/training, etc. Love it there...especially Tarpon Springs...and going to SPONGORAMA! LOL! What a wonderful pinkeep Becky sent you! That sunset picture is gorgeous, I wish I had been there to see it. Pretty pinkeep! Lucky you to have something stitched by her! What a lovely pinkeep :). I saw your comment on Vonna's blog about Tampa so I thought I needed to come by and visit. I grew up in Tarpon Springs (from 5th grade through HS graduation) and my sister still lives down in Tampa. The picture is lovely and the scene is very familiar to me. Have a wonderful day! What a lovely sunset...just takes your breath away! Your pictures are gorgeous! Wow, I really need to take more myself. Your blog looks so pretty. How can you do it all? You are amazing! congrats on receiving a beautiful pinkeep!